Weaving is one of the oldest forms of creative expression. But for Judith Yinyika Chambers, it’s also the surest pathway to bliss. Chambers is an artist from Warakurna, a large Aboriginal Australian community with roots in a part of the country known as the Western Desert — a place where Mars-red plains, dotted with spiky Spinefex, stretch endlessly into the horizon and the Rawlinson Ranges seem to possess the silent knowledge of a Rothko painting. Since 1995, Chambers has been part of the Tjanpi Desert Weavers, a collective of 400 female artists who spin baskets and sculptures out of tjanpi — or dry grass — as a way to tell the stories written in the landscape. Chambers says that weaving also helps her forge a connection with the women around her as well as the generations of women to come. Happiness isn’t a term often associated with the all-too-cerebral art world. But when I visit the Tjanpi Desert Weavers’ gallery in Alice Springs, a remote outback town in the very heart of Australia, joy is the defining mood. The white-washed space is dotted with jaunty, soft sculptures: dogs spun out of harvested grass, neon kangaroos with pert, woolen ears. A far wall is adorned with raffia baskets, in hot-pink and Sunkist orange, shades that bounce and shimmer in the desert sunlight. The works are playful and imaginative, the product of individual artistic visions. They also wink at the collective spirit of this place. Michelle Young is the long-time manager of the Tjanpi Desert Weavers. Her office is plastered with maps of the NPY (that’s Ngaanyatjarra Pitjantjatjara Yankunytjatjara) lands, home to artists involved in the collective — an area spanning 350,000 kilometres across the tri-state border of Western Australia, South Australia and the Northern Territory. She tells me that Tjanpi Desert Weavers was founded over 20 years ago by the NPY Women’s Council, an Aboriginal-owned community organization, as a social enterprise so that women in remote desert communities could earn a living. The initiative also transforms the tradition of weaving — embraced for thousands of years by Aboriginal women in this part of Australia — into something modern and new. Craft, widely considered women’s work, has always been devalued, unfairly relegated to the domestic. 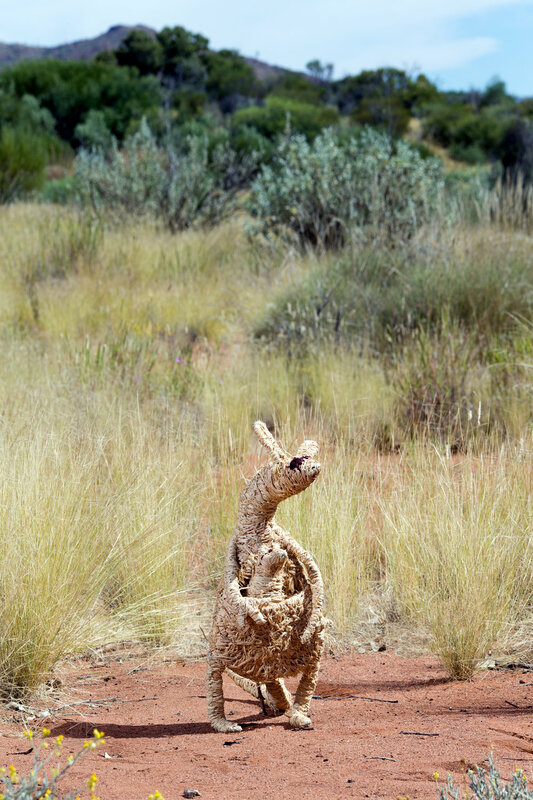 But the Tjanpi Desert Weavers have helped put fiber art on a national—and international—stage. The collective won the 2005 National Aboriginal and Torres Straight Islander Art Award, the most prestigious Indigenous art prize in the country for Tjanpi Grass Toyota, a woven homage to the Toyota Landcruiser, a vehicle that’s a fixture of outback living. In 2015, the group debuted their work at the Venice Biennale as part Kuka Irititja (Animals From Another Time), a collection of native animals that touches on the effects of colonization, in partnership with the artist Fiona Hall. Chambers values this freedom. Her own sense of expression revolves around telling the stories that have been passed down through oral traditions, that the wider public wouldn’t otherwise know. This year, she worked with fellow artist Nancy Nanana Jackson to create Tutjurangara Massacre (Circus Water Rockhole Massacre), a series of two-dimensional sculptures woven from grass, wool, and raffia. The work, a highlight of this year’s Desert Mob, an annual Indigenous art exhibition at Alice Spring’s Araluen Cultural Centre, depicted an unknown massacre near a site called Circus Water.